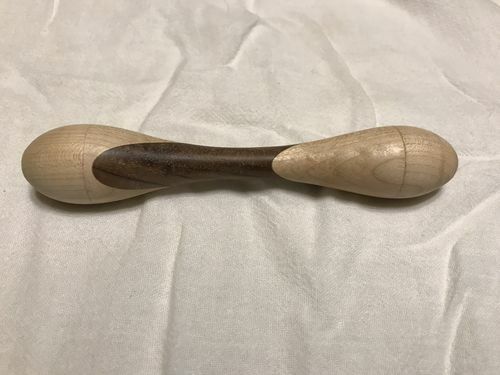 Many, many people I work with are in their prime years for having babies, and it seems like I could make a rattle every month for an expectant parent or someone coming back from maternity leave. 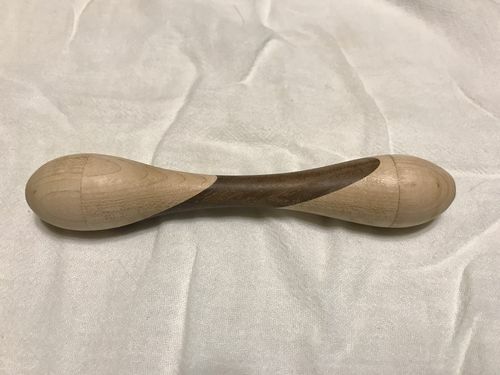 I decided to try a little twist on this most recent one by adding an accent that only impacted the handle, to avoid the mismatch at the joints of the end caps with the handle. My ability to realign the parts after parting off the end has been low, and the material removed with the parting tool makes a mismatch inevitable, anyway. I’m really happy with the way it turned out. Maple and walnut. Shellawax finish. Doh! I just realized I made zero attempt to align the grain between the caps and the handle on the maple. I think I got them an almost perfect 180 deg opposite – lol.